Posts tagged “twin cylinder softener”. Due to the recent severe and prolonged freezing weather conditions many water softeners fitted outside (in Garages, Sheds or outside Cabinets) developed serious damage due to the frost. In many cases these burst causing flooding. Many units were un-repairable and had to be completely replaced at great expense. 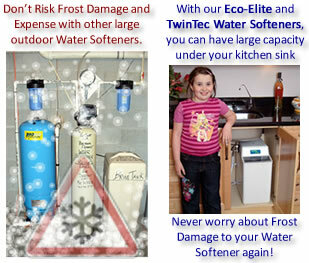 Why risk such damage and expense; with the Eco Elite and Twin Tec Water Softener you can easily install the unit under your Kitchen sink and never have to worry about frost damage again. Call today for more details (087 8122143). Categories: News. Tags: eco-elite, twin cylinder softener, water softener. Aqua Safe Systems, Ballinahinch, Knocklong, Co. Limerick, Ireland. Web Developer: sburke :: Style: Infimum.